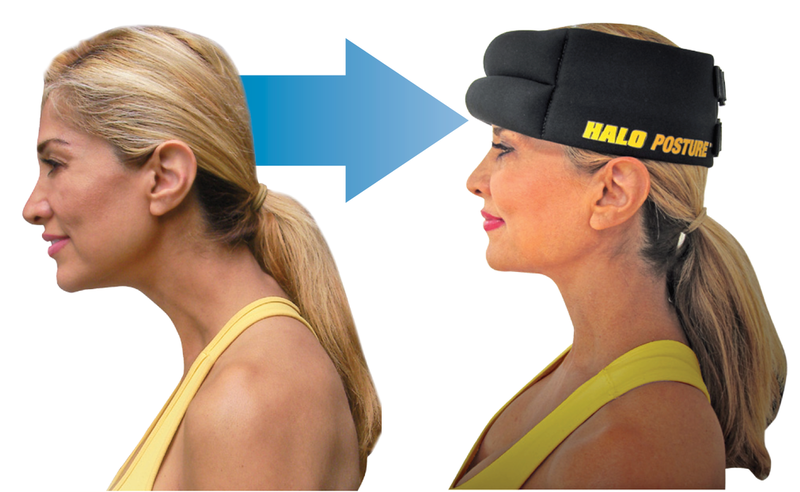 Halo Posture™ Head Weights - Version 2 - Halo Posture Inc.
Do Your Patients Suffer from Forward Head Posture? The Halo Posture™ Head Weight is a clinically-proven, effective product for correcting Forward Head Posture, restoring the normal cervical curve, and rehabilitating weak or injured cervical muscles. The concept of using weights to correct imbalances in posture was first described by Nicolas Andry, the father of orthopedics, in 1741. When the HaloPosture™ is worn, the body reacts to the weight by shifting its center of mass in the opposite direction, to compensate for the increased load. The nervous system of the body adapts in time and need to its environment. When a weight is placed on the body in the appropriate manner, and worn for a period of time, the body will adapt to this new position and gradually develop a permanent, healthier, and more balanced position. This reduces stress and strain upon the muscles and can also help low back pain. Why is the Halo Posture™ Superior to Similar Products on the Market? SAFETY & COMFORT: The Halo Posture™ is made with a material known as Geoprene, which is soft, elastic, and completely non-toxic. Artificial or synthetic fibers can be irritating or harmful. Doctors have observed that patient compliance with spinal weighting protocols increases dramatically when the HaloPostureTM is recommended over other head-weights that are less comfortable and use non-natural materials. DURABILIY: Geoprene is more than twice as durable as its synthetic cousin, neoprene, and will outperform any other cloth material on the market. EARTH-FRIENDLY: Neoprene is made with petroleum chemicals and byproducts. In comparison, Geoprene is an organic compound made from lime-stone whose molecular structure is 99.7 percent calcium carbonate. This means biodegradable materials and a healthier future for our children. BACKED BY RESEARCH: Dr. Dennis Woggon, the founder of the CLEAR Scoliosis Institute, has conducted numerous clinical trials and published research verifying the benefits of head weighting. His research continues to be incorporated into new designs of the Halo Posture, continually improving its effectiveness. The x-rays and diagrams on the adjacent page demonstrate how the Halo Posture™ outperforms the competition. Q. How long should the patient be expected to wear the head weights? A. Although results vary from patient to patient, most doctors versed in head weighting protocol agree that to achieve maximum long-term results, a patient should wear the head weights daily for a minimum of 20 minutes for 60 to 90 days. Activities such as walking, using a treadmill, exercise ball or vibration board will accelerate proprioception and increase stimulation of the righting reflexes. It is important to stress to the patient that continued use (once or twice a week) of the Halo Posture along with adjustments is important to maintain the results they achieve after 60-90 days. Q. Are these head weights effective when addressing Lateral Translation or Tilt? A. They can be effective for Tilt. Simply turn the head weight emphasizing more weight to the side of the head with Tilt and visually establish whether Tilt has improved. Q. Do the Halo Posture head weights adjust for varying head sizes? A. Yes. All the Halo Posture head weights (except the 1 lb Posture) have two velcro adjustable straps to accommodate all head sizes. The 1 lb Posture has one adjustable strap. Q. Are the head weights and its protocol billable to insurance? A. Yes. Please contact us at 888-884-4256 and we will provide you with the billing codes. Q. How can I learn more about the benefits of head weighting protocol? A. With the assistance of Dr. Dennis Woggon, Founder of Clear Institute, we have created a comprehensive thirty-minute video which articulates the diagnosis, application and results of Anterior Head Weighting. Our head weights are made from a highly elastic yet durable neoprene material and weighted with high-density carbon steel microspheres. All of our products come with a 90-day full money back guarantee and a 180-day construction defects warranty. Halo Posture is hand made in the USA.